ePortfolio is a way for you to demonstrate what you are learning inside and outside the classroom while a student at John Jay. Whether you are introduced to ePortfolio through a professor in a class, by participating in a program where you will showcase what you're doing as a member of that program, or if you've just seen some of the vibrant ePortfolios that your peers have created and want one for yourself too, an ePortfolio is a way for you to demonstrate online on your own web site the successes that you achieve offline! Register for one of the courses where the professors will have you create an ePortfolio. See a list of courses using ePortfolio (coming soon). Contact us at eportfolio@jjay.cuny.edu to get your account information. Spring '19 ePortfolio Community Hour Workshop | The ePortfolio Program offers support to help you get started with the creation of your ePortfolio and how to edit it, and add content to it. Sign up online. 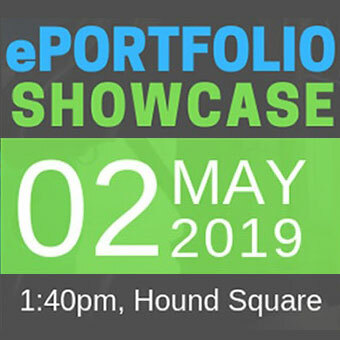 As a current John Jay student who created an ePortfolio recently, you are invited to participate in our 3rd Annual ePortfolio Showcase! Use this opportunity as a way to share with your community the great work and experiences that you are having inside and outside the classroom. This is a session that provides information on all the resources provided by the ePortfolio Program that's available for John Jay students. Come see the ePortfolio Lab and meet our eTerns and other support staff.